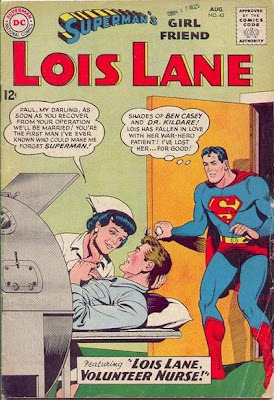 In the story, Lois has been hypnotized into forgetting about her affections for Superman and decides that maybe her co-worker deserves a shot, alarming the heck out of Clark. 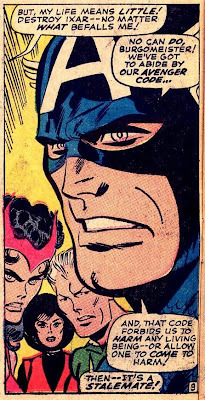 One of the more durable plot ideas of the 1960s was the concept of the doppleganger, the criminal version of the hero. The appeal of these doubles to writers and editors is pretty obvious. 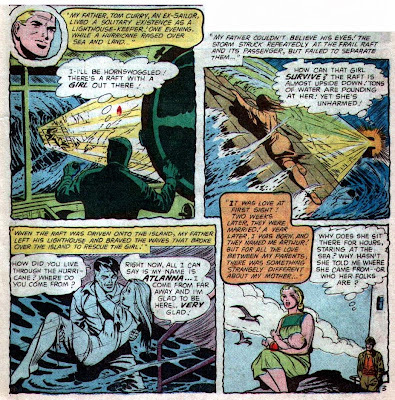 Having created these extraordinary characters with "powers and abilities far beyond those of mortal men", the creators found it difficult to present them with a real challenge. What better solution than to have them face villains with similar qualities? SuperMenace, two memorable DC knockoffs of Superman. Sinestro was a renegade Green Lantern who had abused his power and had his ring and lantern taken away by the Guardians. At some point he acquired a ring that emitted a yellow light and thus was invulnerable to Green Lantern's own beam. Instead of landing in Kansas, this rocket landed among a grudge-bearing tribe of Indians who dreamed of the youngster restoring them to glory, which led to the Shrike (initially) being a criminal, stealing back ancient treasures. Well, if a doppelganger works, then why not a doppelgang? 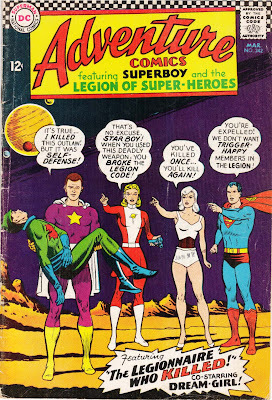 The Legion of Super-Villains was a twist on the Legion of Superheroes and specifically the original three members of that group, who were similarly seen voting down Superboy on the famed cover of Adventure #247. 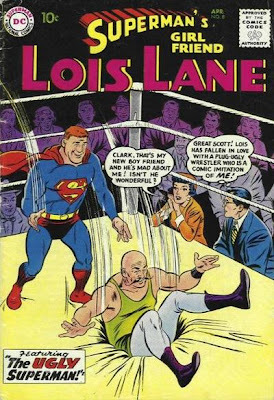 This particular concept for a cover (which looks like a game show) was also used in Action #296, and Jimmy Olsen #87, making it something of a doppelgang itself. Over at Marvel, the Frightful Four were a similar but different version of the Fantastic Four. The Justice League of America had an even more similar opponent in the Crime Syndicate of America of Earth-3. Fortunately his powers turned out to be temporary as is his memory of the experience and so he ends up back where he started, pushing a broom. Some other famed doubles: Crimson Dynamo/Iron Man/, Titanium Man/Iron Man, Gas Gang/Metal Men. Many superheroes had some sort of real duplicate created by a ray or magic or red kryptonite, so we'll ignore those. I don't see a real Reverse Spiderman or Reverse Daredevil or Captain Russia out there, and while you can argue Loki as the anti-Thor, I don't buy it. That's more a personal rivalry that doesn't really imply similarity in powers. For the same reason I'd argue that Dr Doom is not Mr Fantastic's double, nor is Baron Mordo the equivalent of Dr Strange. 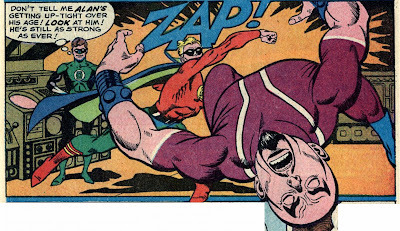 Atom battled a few small villains but I don't think any of his villains really mimicked him beyond that. 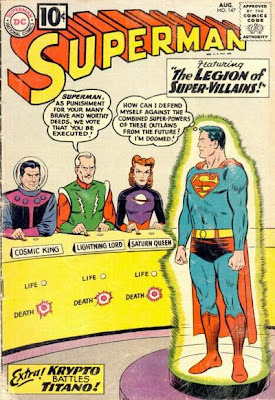 There were of course several Kryptonian criminals who appeared in the Silver Age as doubles of Superman or Supergirl. Update: Kyle points out Professor Zoom, the Reverse Flash. He was in the original post, but somehow an editing mistake left him out. Good catch! Another "disconnect" for me was Cooke's nonsensical decision to make Korean War fighter pilot Hal Jordan...get this...a pacifist. 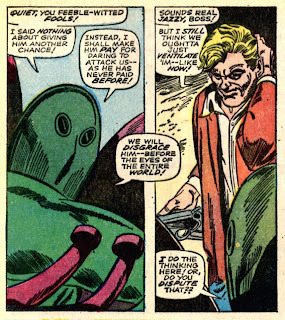 That's right, Hal made a point of refusing to shoot down hostile enemy aircraft, thereby adding to New Frontier's strange moral paralysis when it comes to its historical view of Communist expansionism and the clear need to contain it. 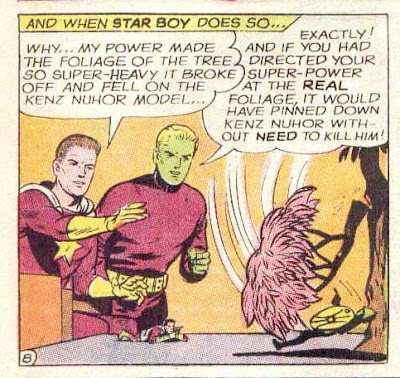 That panel of course shows the Golden Age Green Lantern throwing the haymaker, but trust me, it was a rare issue that didn't feature Hal or his GL identity using his fists. It is possible that Hal's unwillingness to kill in Korea marks him as suitable for the lantern and the ring, although it raises doubts about his suitability as a fighter pilot. 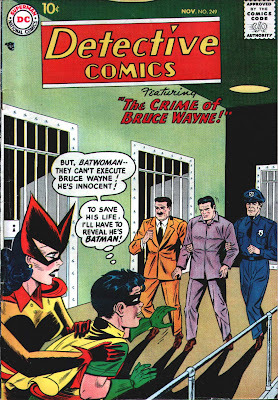 Early on in the Golden Age, DC's heroes were somewhat cavalier about the fate of criminals. Batman's cold-blooded response to the death of the villain in Detective #27 was, "A fitting end for his kind!" 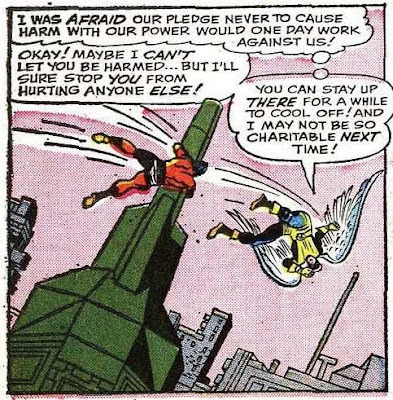 And those early issues frequently showed him tossing villains off rooftops to their apparent death. As I discussed in my (long and getting longer) post on Batman and guns, this changed after Batman #1, in which our hero kills monsters who were once men, and the driver of a truck with a machine gun mounted on the Batplane. As I noted, after that, Batman never shot to kill. 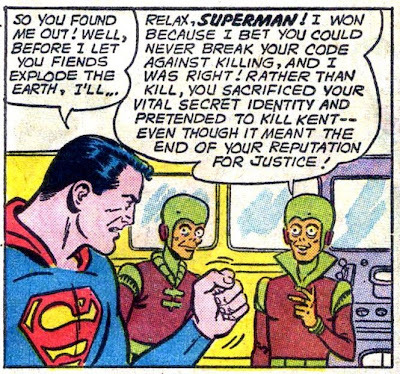 The concept of the hero not killing quickly became established for DC superhero types after that. 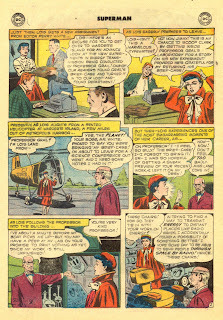 I am not sure where this originated; it is well-known for example, that Doc Savage, a precursor to both Batman and Superman, used "mercy bullets" in his revolver that rendered his foes unconscious rather than killing (although he was quite willing to perform a little "brain salad surgery" to turn criminals back into productive members of society). 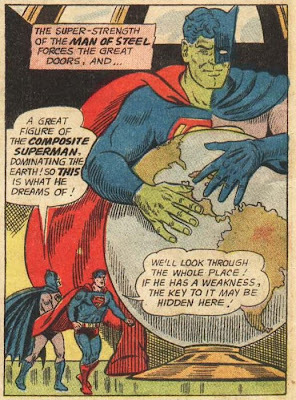 At any rate, this was codified fairly early in the DC Golden Age, and it lasted through the Silver Age. Star Boy was expelled. He and Dream Girl, who was not yet a Legionairre, joined the Legion of Substitute Heroes for the next year or so. 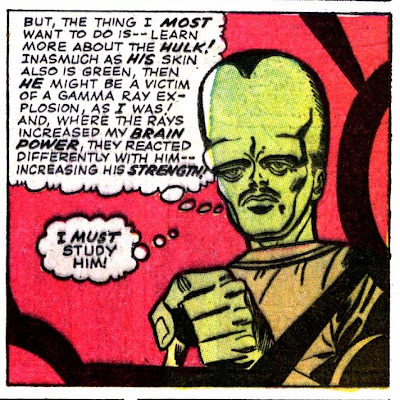 So it's okay, as long as they're "dangerous aliens from space wearing human masks--condemned murderers?" I will update this post as I find more stories that deal with the general DC code against killing. This story features terrific characterization. 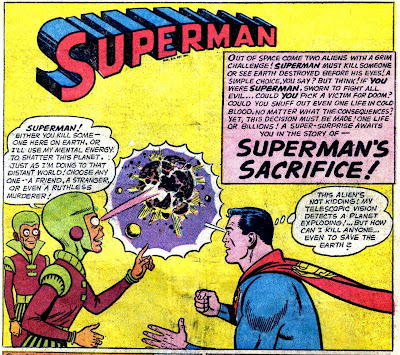 Superman, faced with the option of going against his code or allowing Earth to die, decides to kill himself by purposely exposing himself to Green Kryptonite. However, the aliens are not going to let him off that lightly, so they change the Green K to another element. They want him to kill someone else. Guess who volunteers? Wow, terrific characterization for Jimmy. 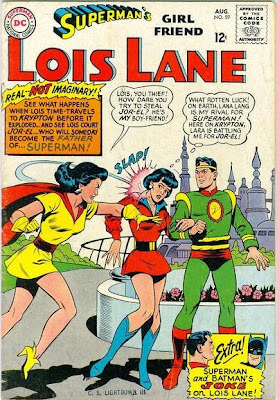 Later in the story, both Lana and Lois attempt suicide (yes, this issue went out with code approval), and in Lana's case she almost succeeds. 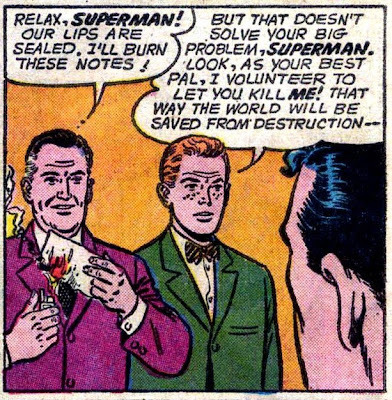 In the end, Superman decides to "kill" Clark Kent by tying him up near a nuclear test blast. 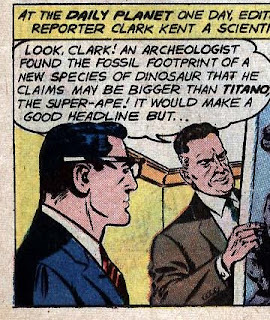 Of course, Clark really survives but he hopes that this will fool the aliens. Yep, these are the same gamblers Rokk and Sorban, who were featured in the nutty World's Finest issue I talked about last year. They were also supposedly behind the Flash/Superman race in Flash #175, although we found out at the end two of Flash's major villains (Abra Kadabra and Professor Zoom) were impersonating the two aliens. 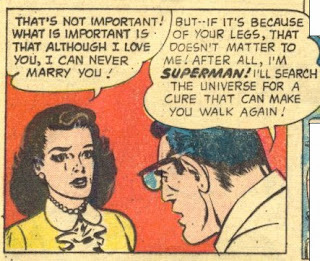 I can't think of another DC comic where a hero had been thrown over permanently by a long-standing girlfriend in favor of another man. 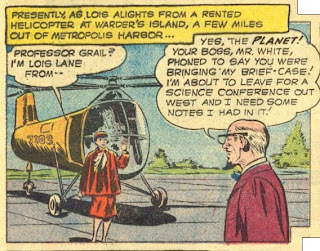 Oh, sure, Bruce Wayne's gals had a habit of dropping off the face of the earth every few years. 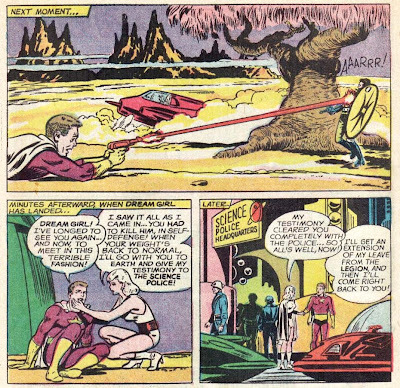 Aquaman had gotten married, as had the Flash (mentioned briefly in this issue). So this was really something different. But that was not all the goodbyes in store for us in this issue. I'll have to do a full post on Pieface sometime, but he was a pretty unique character in the DC universe. Although his name suggests the buffoonish sidekicks of the Golden Age, like Doiby Dickles or Winky, Blinky and Noddy, Pie was played straight, as a serious character. Gil Kane, who had drawn every panel of every Silver Age Green Lantern story, was now out of the picture. This was part of great DC reshuffling of artistic duties in mid-1968 that I will have to cover in depth at some later date. Apparently, DC's artists and writers had been pressuring the company for health and pension benefits, and in an effort to head that off, DC decided to switch around the assignments, probably feeling that the long-term association of artists with characters gave the former too much clout. 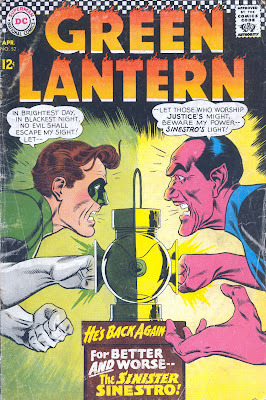 Many of the switches worked, but this one appears to have been a failure, as Kane was back at the old stand by mid-1969, although he only got one more year with the character before the advent of the Green Lantern/Green Arrow series by Denny O'Neil and Neal Adams. You can see that in every case there is somebody standing in one or the other bottom corner who is the closest to the "camera", thus giving us scale. But notice that they do not have always the same angle that they're looking at. 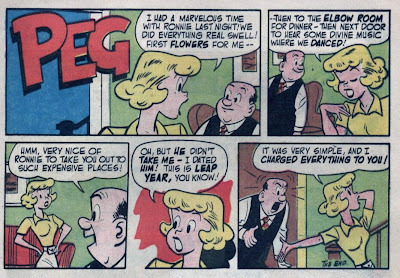 In the first panel, a salesman is looking directly left. 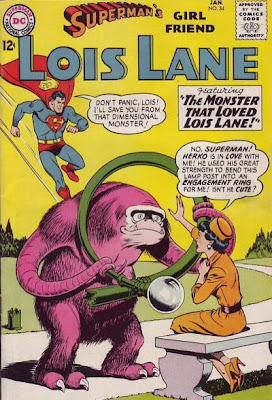 In the second, Lois is looking back and left. 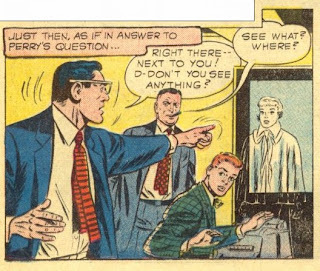 In the third, the professor is looking forward and left Then we see Lois looking right, then left, then the professor looking forward and left. I tend to think of the camera angle where the person in the foreground is mostly facing away from us as the 3/4 shot, because the onlooker is 3/4 looking away from the camera. In this page the third and sixth panels are used this way. In the ones Mark has posted of Robin, I believe that if you look closely at them, you'll see that every one is a 3/4 shot. Granted Moldoff doesn't make this clear always until you look at the set of the shoulders. Now, here's the thing. 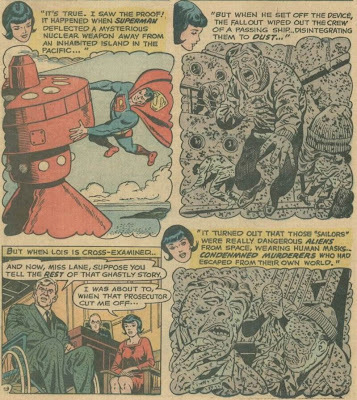 The world's worst comics artist at drawing the 3/4 shot has to have been Wayne Boring, one of the major Superman artists of the Silver Age of Comics. And the main reason why was because he just could not place the eyeglasses on a character to save his life. And it went on for years. 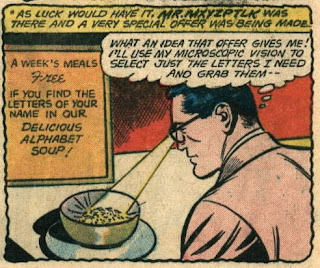 We all bow down before Weissinger, who undeniably created an amazing decade for Superman, but how do you ignore the fact that he let this travesty go on with the glasses? Boring was a terrific artist in the Golden Age, and I would not have been able to draw anywhere near as well as he did on his worst days. But he almost never got the glasses right. 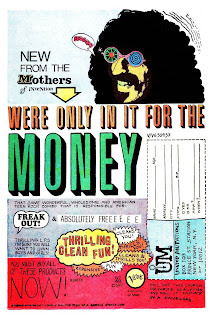 Obviously ahead of their times, the Mothers of Invention ran ads that did not make it clear what they were advertising. A play, as George M. Cohan pointed out, is composed of three acts. In Act I, you get the hero up a tree. In Act II, you throw stones at him. In Act III, you get him down from the tree. Many superhero stories follow this simple formula. But there are two rather crucial parts that sometimes don't work. First, the stones thrown at the hero in Act II can't be too deadly. And second, the method of getting him down from the tree must be credible. 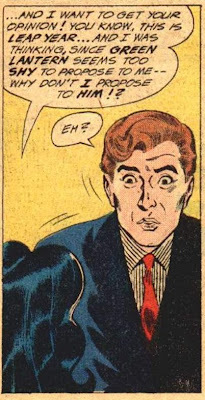 In Daredevil #30-32 (July-August, 1967), Stan went a little too far on both counts. 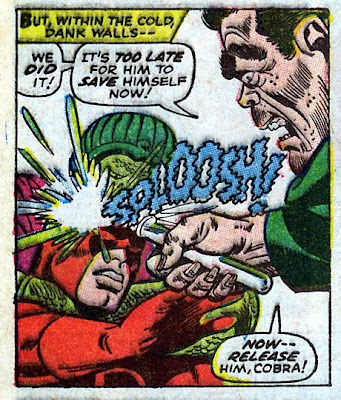 The series features Daredevil against the old Thor villains, Mr Hyde and the Cobra. Matt figures out that they must be behind the series of robberies in the city. And since he reasons that he can't just patrol the city to find them, he decides to dress up like Thor to draw them out. Well, you can probably see the fly heading rapidly towards that ointment. 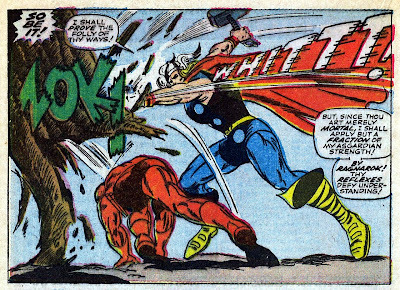 Sure enough, Don Blake hears that Thor is plying his trade in midtown and pounds his cane. Before you can say Ragnarok, Thor and DD are doing the classic Marvel, "I'm a hero and I know you are too, but let's fight for a couple pages so they can put it on the cover!" routine. Well, the stuff in the test tube is supposed to make one blind. But since Daredevil is already blind, it has no effect, right? Heheh. Sorry, Marvel science doesn't work that way. Since he's already blind it takes away DD's special powers of hearing and the other senses he uses to compensate for his blindness. Okay, so the hero's up in the branches and leafs and the stones are being hurled at him. But the story takes a twist. Mr Hyde and the Cobra, sensing that DD is no longer a threat, abandon him. DD somehow manages to find his way back to his apartment (apparently not thinking of changing his clothes). Matt does some heavy thinking. 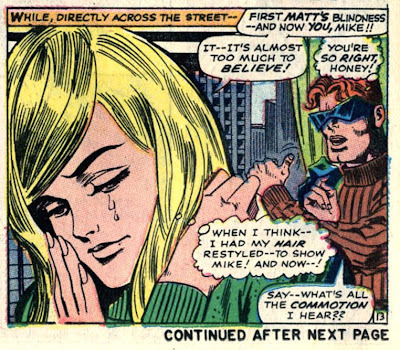 Since Foggy and Karen know DD is actually Matt's supposed twin brother Mike, if Daredevil is suddenly blind he'd better make sure that Mike appears to have been blinded as well. Fortunately the tender scene is broken by the Cobra and Mr Hyde, who have taken up occupation of a nearby rooftop and are threatening havoc. So Mike gets into his DD duds, gets Foggy to help him up to the top of their building, so he can throw his billy-club line across to the villains. And DD tight-ropes his way across the wire, blind and unaided by his other senses, which freaks the crooks out so much they take off. From there, DD makes short work of the Cobra, although Mr Hyde is able to escape. It's an entertaining storyline overall, but it strains credulity to the snapping point. The stones are too rough, and the way that the hero gets down from the tree is not believable. 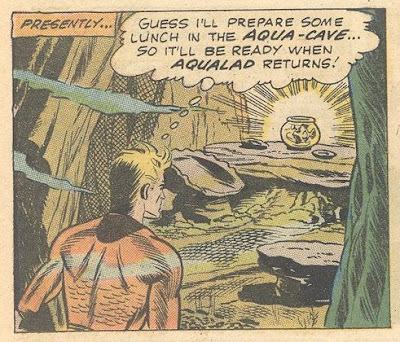 Of all the characters that DC reintroduced in the Silver Age, Aquaman has to be considered the most unique, for many reasons. 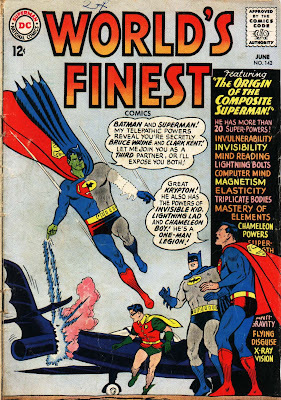 First, he was not a "relaunch"; he was one of the few DC superheroes (along with Batman, Superman, Wonder Woman and Green Arrow) to have been published continuously from the Golden Age on. Flash, Green Lantern, Atom and Hawkman had all been regular characters in the Golden Age whose series were cancelled and thus could be reintroduced to a new generation of readers with revised costumes, secret identities and origins. 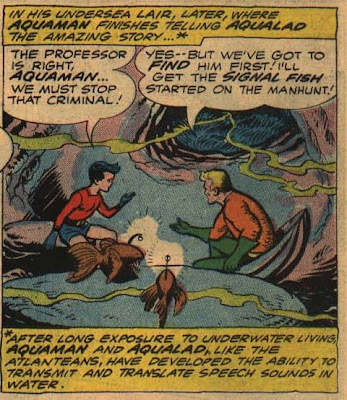 With Aquaman, DC didn't have that luxury, especially since he'd been a part of the Justice League of America from its introduction in Brave & Bold #28 (Feb-Mar 1960). Thus when they decided to give him a tryout for his own title with Showcase #30 (Jan-Feb 1961) they did not try a real relaunch; they just expanded his adventures. His mother turned out to be from Atlantis, and she passed on to her son the ability to survive underwater indefinitely, to mentally command the creatures of the sea, and to swim at amazing speeds. 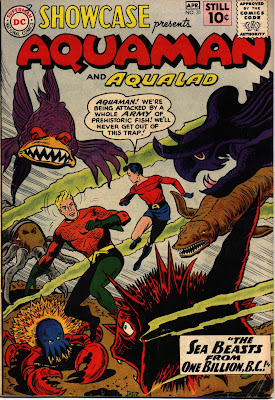 In Adventure #269 (Feb 1960), he gains a companion in Aqualad, an outcast orphan from Atlantis. 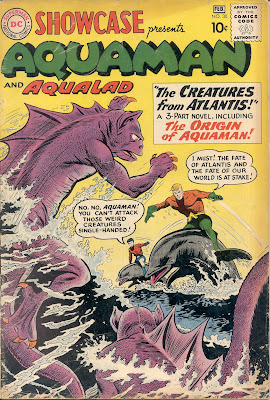 But this revealed another oddity about Aquaman compared to the other Silver Age characters. Aquaman didn't have a private life. He didn't maintain his Arthur Curry identity. He didn't have a home. 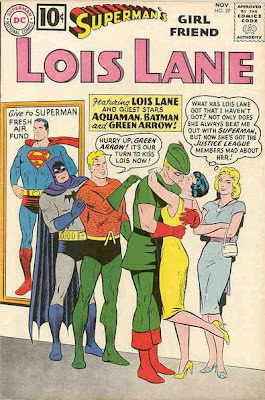 He didn't have a girlfriend (unlike all the other Silver Age DC characters except notably Batman). 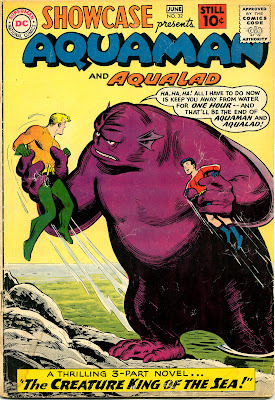 And so things stood when DC gave Aquaman his tryout for the big time with Showcase #30-33. 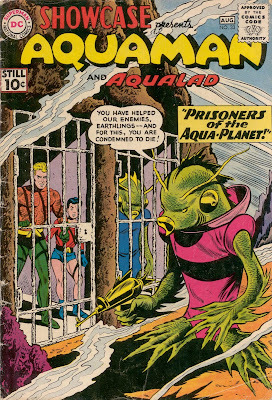 The first story was blessed with the artwork of Ramona Fradon, one of the few female artists of the Silver Age, who had drawn Aquaman for several years in the short stories. 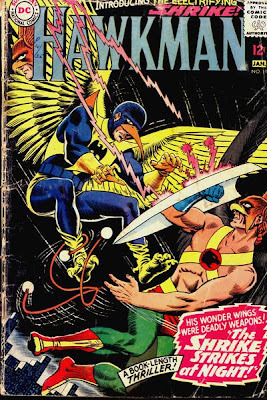 The second story marked the beginning of Nick Cardy's historic run on the series. Those are pretty spartan digs. 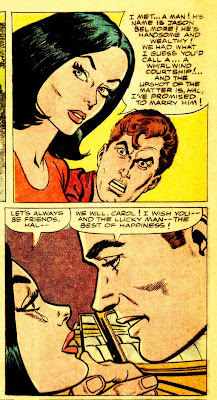 As I have written before, DC's comics were in some ways ahead of Marvel's when it came to girlfriends. 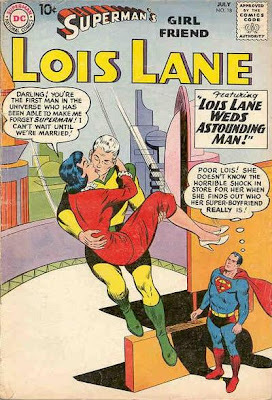 DC had a lot of savvy, career-oriented women as love interests. 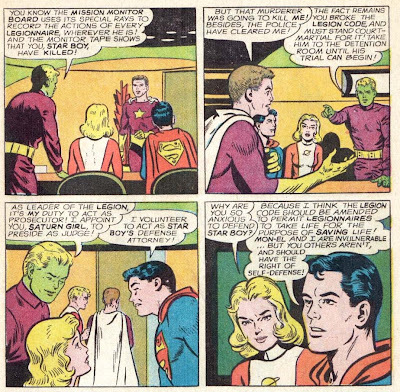 But that's only half the story; DC's gals still tended to be comedic foils for the heroes. 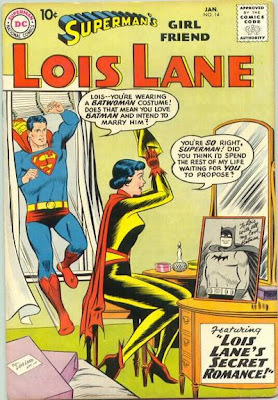 None more so than Lois Lane, who supposedly loved Superman passionately, but was willing to dump him at the drop of a hat. Maybe it was just the blue suit? Any superhero will do apparently. Or has she forgotten that she used almost those exact words to express her love for Astounding Man? 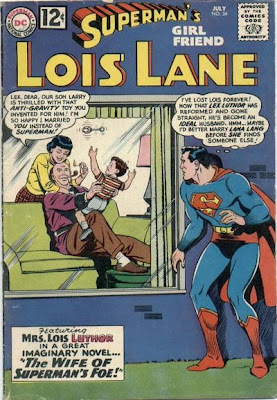 If Supes isn't available, maybe she could steal his dad? Update: Mark Engblom posted yesterday on Superman's many girlfriends. 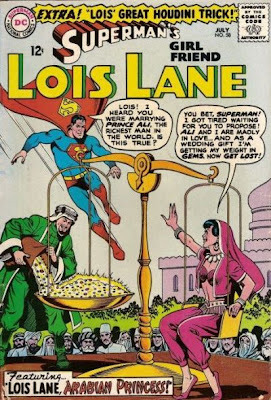 In Action #370, we learn that Earth had not been Kal-El's second planet; that his rocket initially landed on another world, where he did not have super powers, and where he lived, married a woman named Lasil, and had a son named Vol. Eventually, of course, he was transformed back into a toddler and sent to Earth, where only a couple of hours had passed (since time in this alternative world passed much quicker than in ours).